As more post offices close around the country, activists in California are stepping up and protesting the continuing privatization. For two weeks, protesters have been living in a tent city outside a post office in Berkeley, California. The participants are staging the sleep-in to save the post office from closing, one of many closures facing post offices all across the country. The United States Postal Service last week reported a net loss of $740 million in the third quarter—hemorrhaging many conservative leaders claim bolsters their argument that the USPS is antiquated and post offices should be closed. It makes sense that the postal service has proven to be a popular target for conservatives. The USPS is the second-largest employer in the United States (second only to Walmart), except the USPS is also home to one of the strongest unions in the country, employing over 574,000 members. The USPS is also required, bizarrely, to fully fund future retirees’ health benefits, a tall order that has unsurprisingly contributed to the service’s going broke. In 2006, Congress passed the Postal Accountability Enhancement Act, which forced the USPS to fully fund future humans’ retiree health benefits for the next seventy-five years, and they had to do so within a ten-year window. It was an impossible order, and now we’re witnessing the consequences of Congress’s actions. In order to save money, USPS cut the hours of its employees, which further fueled criticism that post offices are frequently understaffed and wait times are too long. Many pundits (conservative and liberal) have joined in on the USPS-bashing because these people aren’t generally the ones using the Postal Service—instead opting for privatized (and more expensive) services like FedEx and UPS, or e-mail for many of their communications. USPS reduced hours at 13,000 small rural post offices, and many larger urban offices have been relocated to inconveniently located annexes. 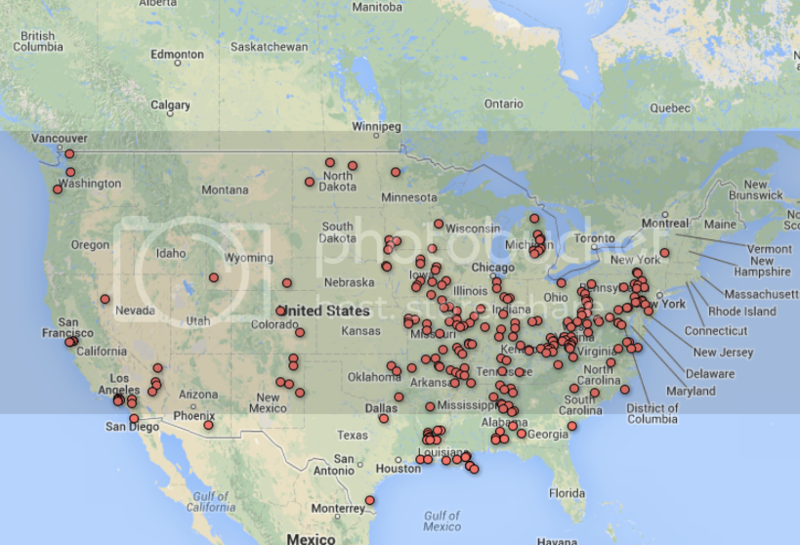 In 2012, 237 post offices were discontinued, according to information released by the USPS. Many areas losing post offices are poor communities of color—a patterned deprivation of public services similar to school closings in cities like Chicago and Philadelphia. In Berkeley, a group of around twenty people has been sleeping on the post office steps to protest its own corner of the world of privatization, and the activists were joined by 100 people who rallied outside the post office over the weekend to celebrate the resistance. 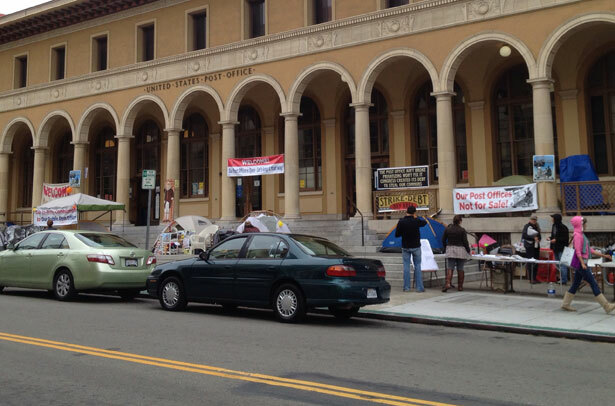 “We demand that the USPS reverse its decision to ‘relocate’ Berkeley’s Main Post Office and sell our Post Office building, and instead provide Post Office services in our Post Office building. We intend to defend our Post Office building and our right to Post Office services with our physical presence until this demand is met,” the group stated. Senators Tom Carper (D-Del) and Tom Coburn (R-Okla) introduced their version of postal reform legislation in the form of the Postal Reform Act of 2013 earlier this month, but postal service advocates aren’t impressed. At this point, it looks as though the new legislation that comes out of a compromise between the House and Senate bills will go a long way toward reducing services to the average citizen: In a couple of years, you’ll be getting no delivery on Saturday, you’ll probably be getting your mail delivered in a less convenient way than you now enjoy, and the delivery time will continue to slow down. If your post office is still open, it will probably be operating part-time and there will probably be fewer windows in action. While the new legislation may provide some relief to the Postal Service in terms of pension payments and funding of retiree health care benefits, the main goal seems to be giving postal management authorization to continue cutting services and slashing jobs. Every billion dollars in cuts means something like 8,000 to 10,000 jobs lost. Ending Saturday delivery and changing the mode of delivery for tens of millions of customers may save $5 or $6 billion, but it will also mean cutting 40,000 to 60,000 jobs. That’s no surprise. The Postal Service’s five-year plan calls for reducing the career workforce to 400,000 by 2017. A 100,000 more jobs remain to be cut. The sale of the Berkeley post office is being handled by CB Richard Ellis Group, which is chaired by Richard Blum, husband of Senator Dianne Feinstein and a regent for the University of California, another institution that has recently experienced a host of budget cuts. Some protesters believe the close relationship between Blum and Feinstein is evidence of a corrupt system. Protester Ian Saxton told Berkeleyside he thinks Blum had used his “public power and private power” for his own personal gain and that the UC Berkeley system was to blame for the sale of the post office. Mass protests against ALEC are bringing attention to the group that has historically worked under the radar.